What will happen if you have a front tyre blowout? What will happen if you have a front tyre blowout? What will happen if you have a front tyre blowout? What should you do if you have a front tyre blowout? 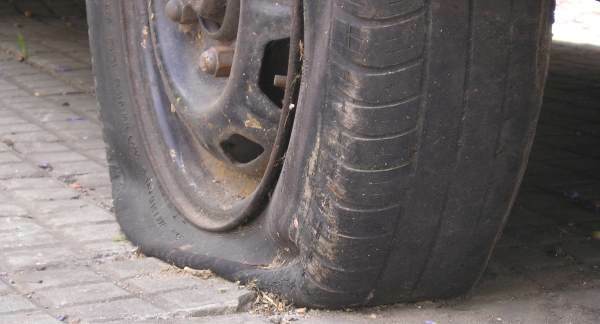 Your car will pull strongly in the direction of the side of the blowout if the front tyre goes flat. Don't hit the brakes hard or you could spin. Hold the steering wheel tightly and compensate for the pulling to one side. Take your foot off the accelerator and the vehicle will slow down automatically - more so than usual because of the extra rolling resistance of the flat tyre. Once you've got the speed down enough, use light braking as you bring the car to a halt on the side of the road. Make sure you leave yourself enough room to change the tyre - i.e. if your blowout is on the left, don't pull up hard against a wall or fence (unless that's the only safe place to do so). Similarly, if it's on the right, pull further off the road so that you're not in danger of being hit by other traffic. If you manage to stop quickly enough the tyre might be able to be repaired, unless there's been a catastrophic failure e.g. the sidewall has blown out. Some cars come with a foam repair kit designed to inflate your tyre and seal it with foam, which is enough to get you to a tyre repair shop. If you don't have that, fit your space saver wheel. This video has some great advice and examples about what to do if you have a front tyre blowout.